The Supreme Court and the "Modern Liberal Judicial Activist’s Favorite Tool"
Chief Justice Taney’s ruling in Dred Scott marks the Supreme Court’s first use of the modern liberal judicial activist’s favorite tool—"substantive due process"—to invalidate a statute. In striking down the Missouri Compromise of 1820, which prohibited slavery in the northern portion of the Louisiana Territories, Taney nakedly asserts: "[A]n act of Congress which deprives a citizen of the United States of his liberty and property, merely because he came himself or brought his property into a particular Territory of the United States, and who had committed no offense against the laws, could hardly be dignified with the name of due process of law." Substantive due process had its beginnings in state court decisions construing 'due process' as used in state Constitutions. Taney in his Dred Scott opinion gave the idea wings when he said ‘[A]n act of Congress which deprives a citizen of the United States of his liberty or property, merely because he came himself or brought his property into a particular territory of the United States, and who had committed no offense against the laws, could hardly be dignified with the name of due process of law,' 19 How. 393, 450. That view – expanded and refined – meant that the judiciary judged legislation by whether it was reasonable, rational, or desirable. As Edwin Borchard once said, "if the due process decisions on substantive law prove anything, they demonstrate that the Court's judgment is the product of the will. It is the social and economic predilection which speaks." Dred Scott was textually based on a Due Process Clause (in the Fifth Amendment, applicable to the National Government), and it was in reliance on that Clause's protection of property that the Court invalidated the Missouri Compromise. 19 How., at 449–452. This substantive protection of an owner’s property in a slave taken to the territories was traced to the absence of any enumerated power to affect that property granted to the Congress by Article I of the Constitution, id., at 451–452, the implication being that the Government had no legitimate interest that could support the earlier congressional compromise. As Souter said, Taney’s (awful and weak) enumerated powers argument was ostensible support for Taney’s assertion of a due process violation. Not vice versa. Each one of the several awful and weak arguments presented by Taney and his concurring justices against the Missouri Compromise provided independent support for Taney’s allegation of a due process violation, in view of the unanimous SCOTUS opinion the year before stating that the first step in a due process analysis is that, “We must examine the Constitution itself to see whether this process be in conflict with any of its provisions.” Incidentally, many scholars have agreed with Edward Corwin that when Taney briefly mentioned due process he "carries with him only two of his associates, Grier and Wayne," which again would mean that SCOTUS did not rely upon SDP in Dred Scott (the same conclusion is reached by the many scholars who have described Taney’s statement about due process as "dicta"). Judge Ethan Greenberg perceptively wrote in 2010 that Taney cited the Due Process Clause "in a very loose way in an effort to dress up what was an inherently weak and flawed argument for invalidating the Missouri Compromise," and did not rely upon SDP. Saying that Taney did rely upon SDP may somewhat stigmatize SDP, but it also somewhat legitimizes SDP which is not something that even one of the nine justices in Dred Scott sought. Taney’s remark about due process was "meager and somewhat obscure" according to Don Fehrenbacher, so we may never know with 100% certainty exactly what Taney meant. 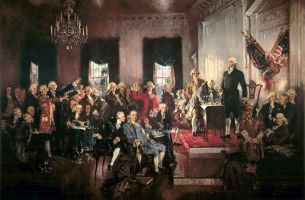 Gerard Magliocca has speculated that Taney was using the Due Process Clause as a tool to help construe the scope of implied congressional power, versus creating an exception to express congressional power. 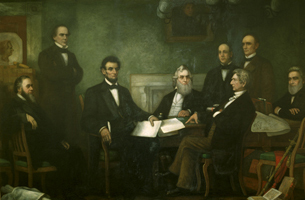 Other scholars have speculated that the Missouri Compromise would have satisfied Taney’s due process complaint if that federal statute had defined a misdemeanor or felony instead of simply banning slavery in the territories. Either way, Dred Scott is no precedent for substantive due process.